Gift Cards must be present at the time of redemption. 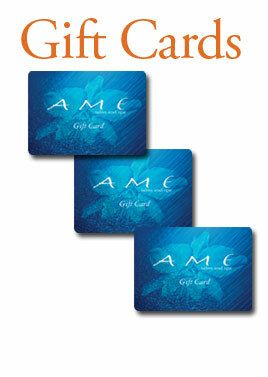 AME Gift Cards may be used for purchasing products or services only. Gift Cards are not redeemable for gratuities, cash, or credit. AME cannot accept responsibility for cards lost or damaged or any unauthorized use of cards. Gift Certificates are non-refundable. Gift Cards must be present at the time of redemption/payment. NO EXCEPTIONS WILL BE MADE. The information collected on the AME Salon and Spa website helps us to understand the customer’s interests and helps to improve our website, in addition to the processing of products purchased on the e-commerce site. AME Salon and Spa does not sell, give or trade the information received from our website.